I'm not a big Halloween fan. If you are interested in my philosophy about it you can read "Evolving Feelings Concerning the Celebration of Halloween." But this isn't a philosophy blog. 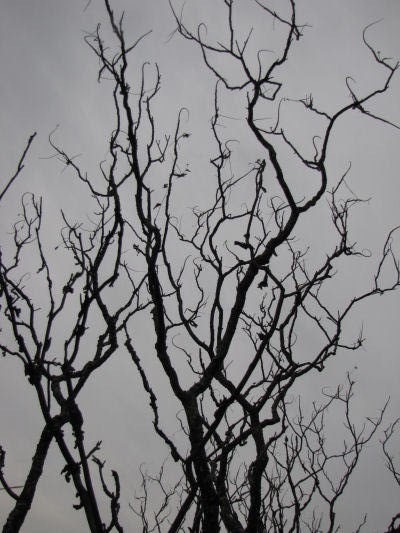 So, I'm just posting some pictures of things that some people find spooky. I never used to be able to understand that at all. But at this point in my life, I've spent enough time with people who are not comfortable in the outdoors that I guess I can see where their feelings come from. Remember the point of My Quality Day? Back when it was hard to find anything good in most days, I made it an exercise to find SOMETHING good. Today was one of those days. It poured all day. 3.4 inches of rain, poured. I could hear the rain on the windows when I woke up to the sound of the phone ringing. I knew it would, because I had told Joshua to call as soon as he had talked to the vet. Late yesterday afternoon he walked over here with his two dogs. I should explain that Josh is the middle son, who lives nearby. The smaller dog is a little black chihuahua, named Loopy. The picture above is Josh and Loopy a couple of Christmases ago. A picture of Loopy yesterday or today would not be welcome. She was obviously one sick little dog. Actually, she doesn't like me very much, but she stood in the kitchen with her tail between her legs, shaking, and she let me touch and pet her. That is the first time ever, in the 6 years Josh has owned her, that Loopy let me touch her unless Josh was holding her. He said that she had not pooped for two days, and wondered what to do. Well, I hadn't ever tried treating a dog with a laxative, and she is so small I wouldn't even know how much to try. I felt her belly, and it wasn't swollen or hot, so I told him to call the vet in the morning and then call me. Oh, did I mention that he has no car, so I knew I'd have to drive him. By this morning, Loopy had started bleeding. Exam, blood test, (Loopy let me hold her the whole time we waited for the test results- like I said, sick doggie) diagnosis... she had a badly infected uterus, which wasn't hot or swollen because it was draining, but she needed to be spayed immediately. So we left the dog to her fate, I took Josh home, and got home myself just about in time to eat lunch. But by then, of course, I had that flaming headache. I spent the afternoon trying to complete some assignments, and did succeed a bit, between holding my head and listening to the rain. No walk for Maggie or me. It was so dark in the house I had to turn on the lights. But at 3:30 the vet called to say that Loopy was awake and doing well, we could pick her up. So it was off to Ludington again. Loopy was groggy, and her huge ears were droopy (they are her best feature! ), but she was feeling well enough to give me the evil eye, and she wanted Josh. So the quality in today is that Loopy is alive. The infection was so bad that the vet said she probably wouldn't have lived through the weekend without the surgery. I bought a cheap pizza to celebrate. Horray for the strong spirit of a little black rat with big ears! A to Z It Is ! OK then! A "nature's alphabet" took an early lead and never looked back! Presented here, as a preview, are A and Z (unless I find better ones). Once I saw that it was destined for greatness, I began hunting with the lens. I haven't gotten all of the letters yet, so no promises on when I'll be able to prove that I know my ABC's, but I won't make you wait too long. No one wanted food! I was thinking of foods as art when I set it as a choice. I've linked below to some previous posts with that idea. It has been interesting to see how the voting went, and I'm REALLY happy that so many people participated. Thanks! 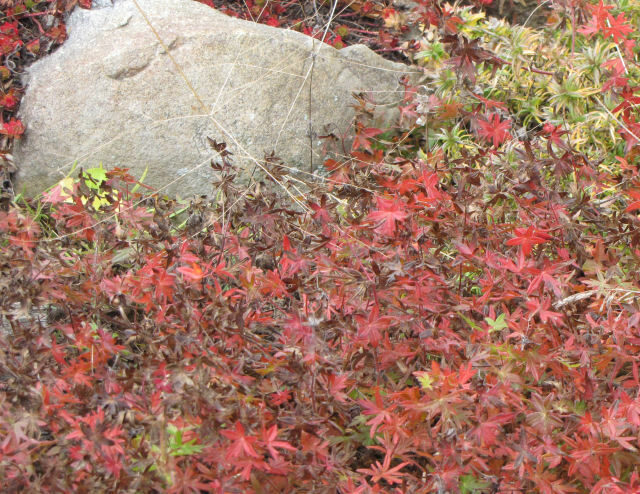 Quite a few other people have blogged about this plant, but it caught my fancy today, so here is my version of a familiar fall sight in the eastern United States. As I looked out over the field, it almost reminded me of the "fairies" I tried to catch in September. 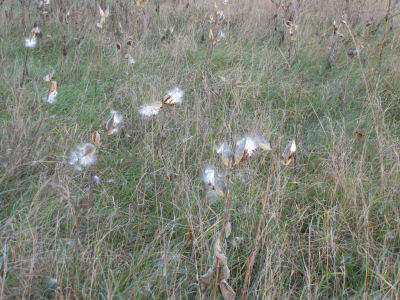 But of course it was ... the lowly milkweed. 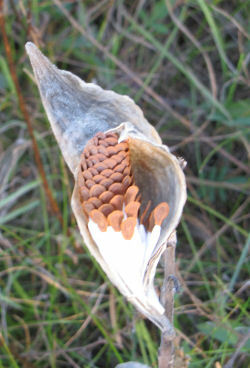 One characteristic of all milkweeds is their pointed pods, often growing at odd angles from the main stem. 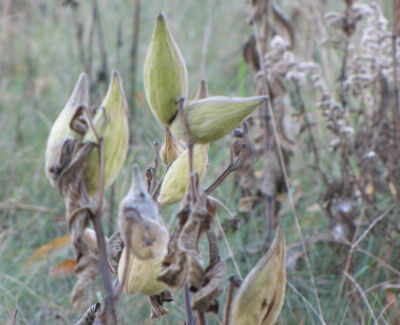 Inside are ranks of seeds with silky hairs attached. But when they are inside the pod they are packed tightly together in ranks. They almost look like a pine cone! I just love how they look and feel at this stage. If you run your hand over the "cone" with the grain, they feel smooth and yet powerful. You can almost sense the compressed energy held in that bundle. Once they are freed from the pod, watch out! 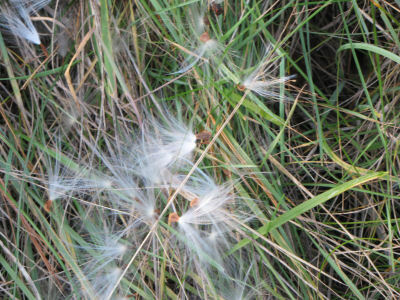 The hairs spread out, turning the seeds into little helicopters ready to transport their life to the reaches of the neighborhood and beyond. I just like this next one. 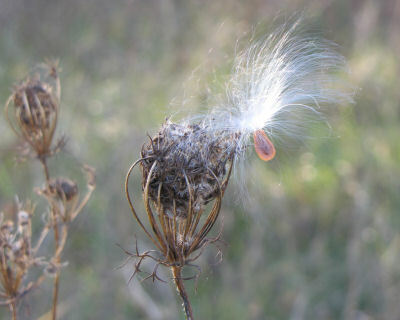 Its one milkweed seed caught on a seed head of the Queen Anne's Lace. It looks like a fireworks display that is being devoured by some monster spider. 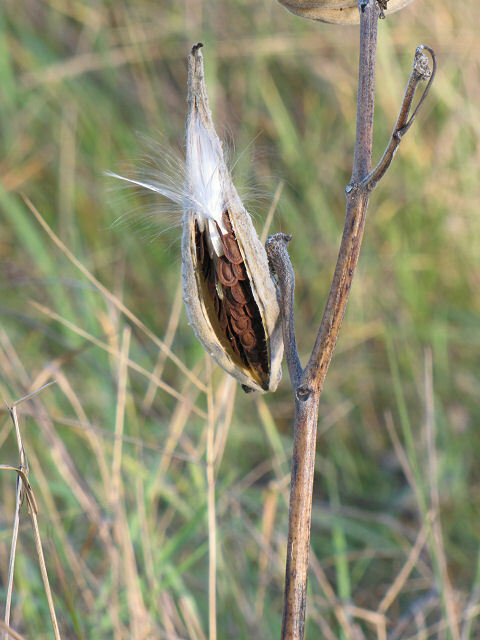 A few years ago I collected pictures of a number of different milkweeds. You can see them at the link below. 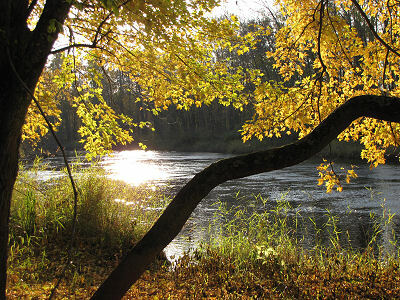 Tomorrow, if I can find the picture from a few years back, I'll show you how the fall colors are different this year. I got an email last night from a woman I had met at National Trails Day this summer. She asked if I could help her spot her car for a hike on the North Country Trail near me. So many people have helped me on my way, as I hike, that I like to help others when I can. I interviewed her for my next newspaper column, and I also posted that on the NCT News blog. You can follow the link at the end for that story. It worked out great for Maggie and me to hike with her, for 2.5 miles, and then she went on, and Maggie and I turned back. It had rained earlier, but was breaking up into occasional gleams of sunlight working through the fog. On the outward trip I talked with Marilyn; on the way back I hunted for camera treasures. The Case of the Disappearing Dog! I forgot to take Maggie's orange vest. Not good. I tied some yellow flagging tape around her neck, but it wasn't much help. But it's only small-game hunting season, and those hunters are usually much more careful. I don't even go to the woods during gun-deer season. Can you see my brown pup in the brown leaves? 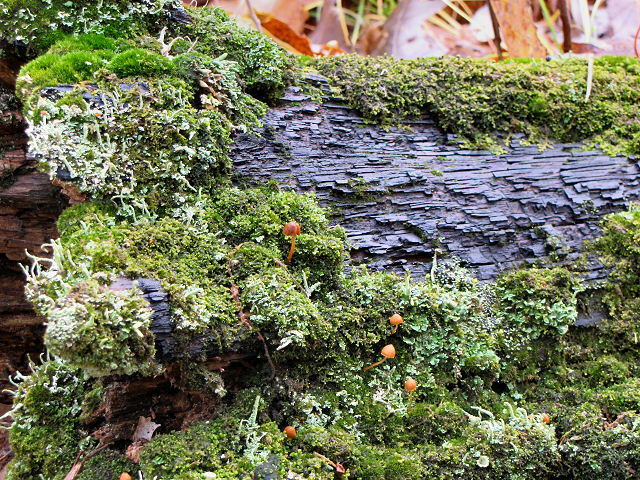 I just like the way the moss, lichen, and little mushrooms look against this log, dark from the days of soaking. As I said another day, the colors this year have been predominantly yellow and gold. Here's one more little golden maple that just "popped." It's actually a red maple, which usually do turn red in the fall, demonstrating the shift to yellow this autumn. I think this is the best one! It's Witch-Hazel, Hamamelis virginiana. Yes this is the plant that the astringent comes from. It is extracted from the wood and bark of this shrub, common to northern woodlands. I just liked the spots and the sun catching on the undersides of the leaves while the tops remain dull. You can click this one to make it bigger if you want. Pretty nice morning! Wrote my column and some other writing assignments this afternoon. Maggie napped. So, big deal... but I have made 359 entries, and I'm still having fun. I've made an impressive list of new friends. I offer to each of you a muffin (see Oct 23) and a cup of coffee... it will just have to be virtual. I haven't met any of you in real life yet. I've learned that I like teasing you all with a short quiz occasionally, and awarding the winner a free ad for a month. So here you go! Send entries to jhy@t-one.net before midnight EDT October 31 (that's before the time changes). I'll award the free ad, and change the top commenter's links on November 1. I’m not a big fan of Halloween, but since it’s October, some of these questions will be distantly related to that theme. It’s a pot luck collection of questions. 3. Your friend comes to the office party dressed as a Tibetan monk playing the bagpipes. What do the following have to do with his costume? 4. What movie (possibly scary) has the line near the beginning “That’s one dead burg,” and ends with the number 601 appearing on the screen? 6. I almost forgot the most fun question! Guess how many birds are on the wire. 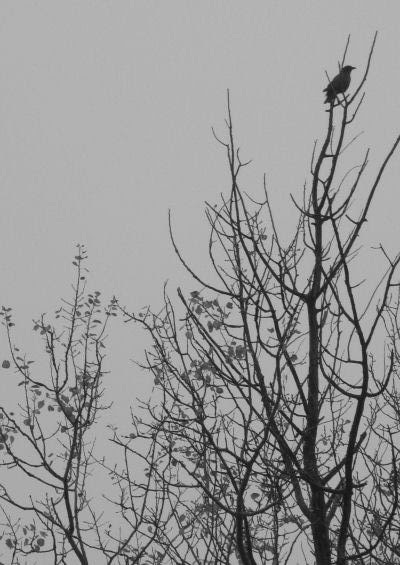 (Not flying or in a tree.) I know it's too small to count. I said "guess!" 7. For everyone who gets all the short answer questions right the quality of this answer will be the tiebreaker: Flashlights are a staple of every modern child’s Halloween costume. And flashlights require batteries. Who named the battery and why was it given that name? I don't seem to talk about it very much, but you may remember that there is a small creek in the valley in the cemetery. 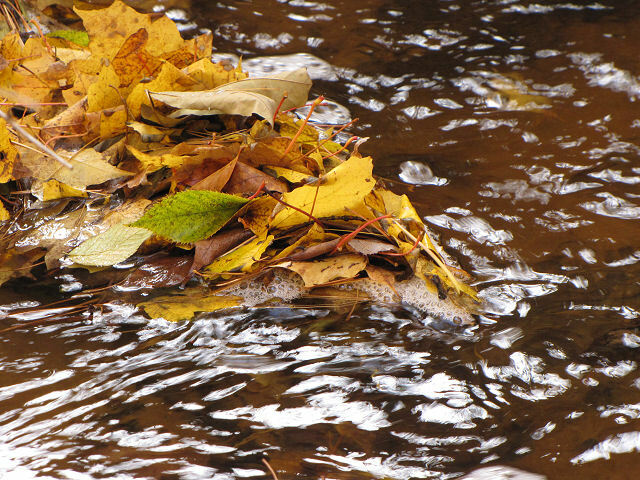 Usually at this time of year it's nothing but a tiny trickle. But it's been raining here, right? 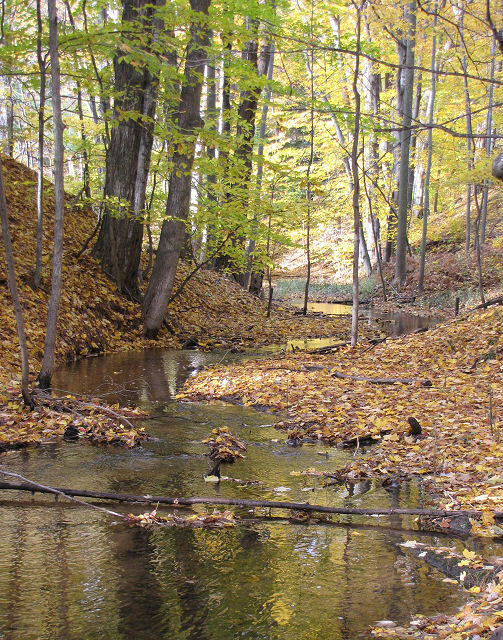 Today when I walked down through the gully, ankle deep in golden leaves, I found the creek more magical than usual. It's supposed to rain some more, but not this afternoon. It was over 50 degrees, and the SUN came out! 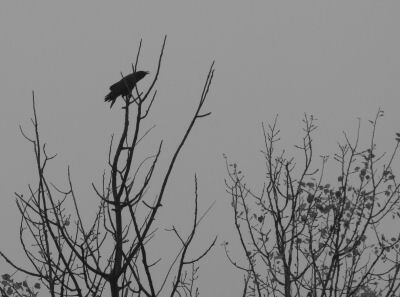 I'm strictly amateur as far as photography, but I like to think that I can predict what the camera will see fairly well. Not today! I expected the pictures I took to be a lame collection of dappled light and shadows without enough definition to be worth saving. But when I looked at them, I was pleasantly surprised and knew I could show you "my" (the city's) creek at its best. Everything was turning out well! 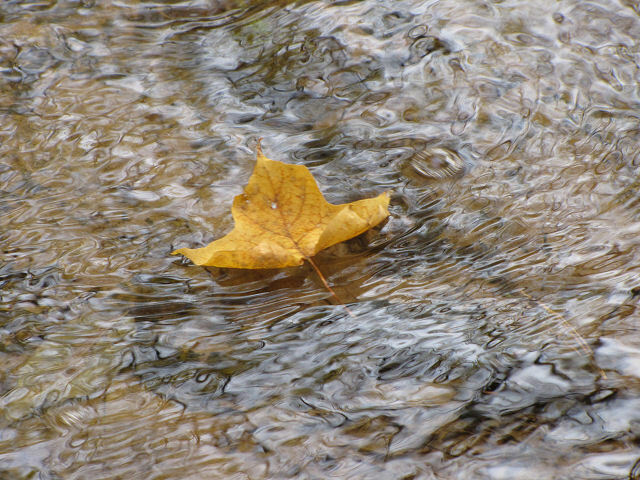 I saw this leaf float by, whipped the camera around, and clicked it without giving the camera time to focus. Yet there it is! traveling the little ripples. 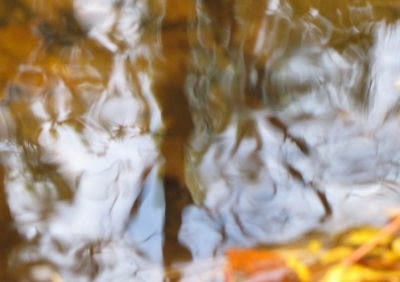 I took this one more carefully, and discovered that the watery background is the best part of this one. I was trying to get "artsy" here. Not sure I succeeded, but I do like the swirly, caramel look. But I think this one is my favorite! I had no idea till I opened this one on the computer that the water would look brown and contrast with, yet complement, the leaves. 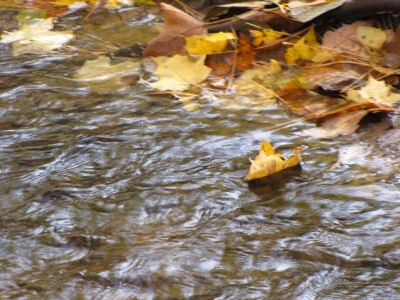 Wonderful how a little sun can brighten a day, a leaf, a stream, a disposition! Tomorrow will be the monthly contest. Come back and play for a free ad for a month. Still cold and wet here. But it wasn't actually raining when it was dog walking time. The gold leaves really seemed to glow under the gray skies in the afternoon light. As I walk toward the cemetery the tree in the foreground is an aspen, and you can see the line of trees in the background that is the edge of the cemetery. None of these pictures is that spectacular. But I just liked them, and I didn't touch them up at all- they caught the light intensity pretty accurately. As I pass that aspen tree and head down to the cemetery this section of trees is quite dense. This is the city cemetery, and it has an older section and a new one. The older one is on my side of the road, with lots of trees, and I like that a lot. Of the two large trees, the left one with the horizontal branch is where I tested the new cache hanging idea. This view shows some of the sumac in front of the gold. Some years they are bright red, but the reds aren't as good this year. Even so, there is a nice blend of colors. The most open area on my side gives this view. I think this is my favorite of these pictures. I like the way the darker background just sort of pulls me in and the leaves around the graves. So, none of this is very original or spectacular, but it's there for me to enjoy day after day, and I do love it. It started raining two days ago, and it hasn't really stopped since. Supposed to keep it up for several more days. 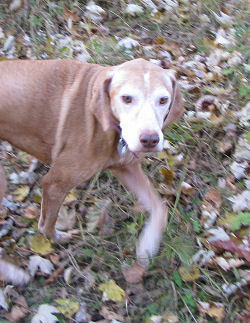 Maggie and I took a quick walk between downpours but it was really a cold, damp, dismal day. It was a good day to warm up the kitchen with the oven and create some good aromas. I decided to bake something. The picture above is a hot dish that I actually made earlier in the week. It was really easy, and really yummy. That is, if you like sauerkraut. The recipe was on the can, so I can probably share it without any copyright concerns. Besides, it's barely a recipe since you can use any quantities of the ingredients that you would like. Fry some onions with some cut up pieces of kielbasa in a little oleo. Add some peeled, coarsely chopped apple and cook till the apple is softened a little. Add a can of sauerkraut and cook over low heat till the whole thing is heated through. I liked it a lot. I can tell from the poll above that no one really wants this to be a food blog. And it won't be. (I was kind of thinking of foods as art in the poll, not recipes). But since this blog is also about sharing some accomplishments, the days I can get myself into the kitchen are a big deal for me. I basically gave up cooking about 17 years ago. I figured at the time that I had already cooked a couple of lifetime quotas of meals (that's a different story). Om and I liked totally different foods, and the kids were gone! Since then, I've mostly cooked for myself, and occasionally on holidays or when beaten severely about the head and shoulders with a cosh of good old fashioned guilt. But no one has starved. When Om had his heart attack two years ago I went back to cooking full time and re-doing all kinds of recipes to make them healthy for him, and finding a bunch of new ones that he would be willing to eat. I managed to keep that up for about 4 or maybe 5 months. He gradually figured out what he was willing to eat long term, and willing to fix. He is still eating healthy, and is healthy! But I find myself less and less willing to even bake anything, which I did like to do even when cooking was less than a thrill. So, who cares, right? Well, the problem is that I do. I really don't like processed foods much at all. So if I want to eat what I like, I need to make it! I bought a little $2.00 book called Fall Baking when I was in Ohio, and today I made Pumpkin Cranberry Muffins from it. There are some standard changes I make to everything I bake for us now, to make them healthier for Om. I substitute Splenda for half the sugar, leave out the salt, use better quality oil, and use Egg-Beaters for the eggs. Even so, these muffins have a pretty hefty calorie count at 252 each. Their other values are good though. Here's how they came out, and THEY ARE YUMMY, too yummy for their calories. I have a collection of low-fat muffin recipes that use cottage cheese instead of oil, and I think that this recipe can be adapted to that method to make it lower fat. Meanwhile, we have muffins to last for a little while- I made two dozen! So I promise not to turn this into a food blog, but that's what happened here at Chez Shark today. Pink makes me blue, but blue makes me smile. 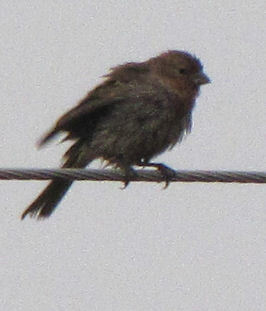 Even when they are too far away to get a great picture, you know I'm just a sucker for those little bluebirds! What are they doing hanging around here yet, almost the last week of October? Especially this week. It started raining yesterday, temps in the 40's, not really very pleasant outside. 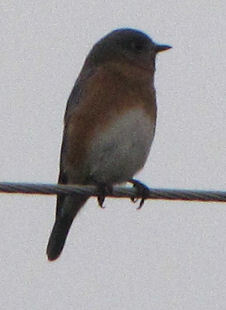 But here was Mr. Bluebird, sitting on a wire, just as smug and smooth as can be. Mrs. Bluebird looks a little more frazzled. I'm sure she is the one who had to do all the housecleaning to get things ready for their trip south! They made me smile. On the other hand, I'm not a big fan of pink. However, I really love my rock garden. 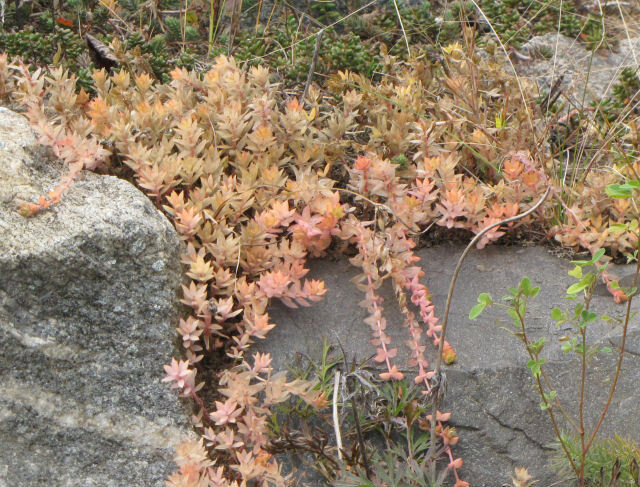 The reason that the pretty pink sedum makes me blue is that with all the hiking this summer I never even weeded my rock garden once. It's pretty sad. But a couple of spots are pretty, even if they are pink. The one below is Sedum sarmentosum, sometimes called Stringy Sedum. It's about as common as you can get, but it's a lovely yellow-green in spring, then blooms yellow, and turns pink in the fall. This is the Bloody Geranium. The flowers range from light pink to purple (mine are light pink), but it is named for the color of the leaves in the fall. Both of these rock garden plants are really, really sturdy. They seem to survive the serious neglect and bad soil of my hillside. See My Bluebird of Happiness for better bluebird pictures. This time of year, the birds are more than willing to cooperate with anyone who still wants to play the game. So how many birds swooped in, en mass, to share this resting place? How about this many? Looks like quite a few. Please note the tree branches on the right, and then look for them in the next picture. Wow! They hung around just long enough for me to snap a couple of pix, and then swept away as a group, certainly thinking about warmer wintering grounds. P.S. My first blogoversary is coming up on October 26! I'm not doing any big contest, but it will be a great day to post the "regular" monthly contest for one month of a free ad. So get ready... I think it will be an eclectic mix of stuff. P.P.S. I've added a small poll by which you can help me focus my search for things to share with you. Thanks! Let me quote to you the section from my book North Country Cache of the last time I rode this bicycle. The date was March 1999, and I was doing an Ohio hike in a similar style to the one I just returned from- walking and riding bike. But I had my road bike on that trip. From chapter "Puzzled: the Bike Breakdown"
My guardian angel continues to be on duty. I do not say that in a flip manner. With just three miles yet to hike, on the last day of this adventure, my rear axle breaks, locking up the back wheel. If it had happened five minutes earlier I would have been on a two-lane state highway crossing a dam with no shoulders, metal guardrails, and heavy traffic. If it had happened two minutes earlier I would have been riding down a steep hill, traveling at perhaps 30 mph. If it had happened when I had been riding at all, I might at the least have had an unpleasant fall. But it happens just after I have carried the bike across a set of really rough railroad tracks on a road closed to regular traffic. 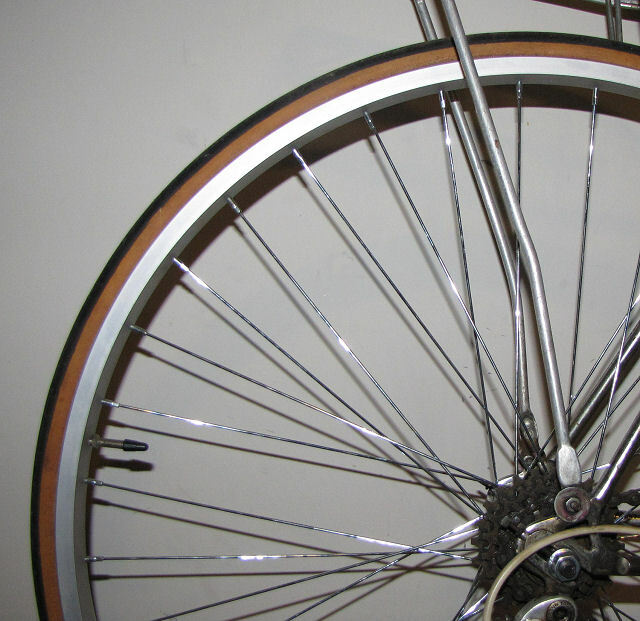 I am remounting to continue the ride, when the wheel locks. A short walk to a country club gives me a safe place to leave the bike for the rest of the day. What seems to be a short section in a book makes for a long blog post. It goes on to explain how I ended up being taken back to my car by the chief of police, who treated me, covered in bike grease, with complete dignity and respect! So I ended up hanging my Fuji Finest (a high end road bike 35 years ago) in the shed. I bought an entry-level mountain bike so that I could ride on dirt roads, and I've never regretted that decision. Yet, it was pretty tough to ride with anyone who had a road bike because mountain bikes are geared much lower. I just couldn't keep up. Well, even the Finest is subject to the effects of time. See how the protective cover for the brake lever has deteriorated? Oh yeah, and there is dried grass stuck on the handlebar tape, probably from some small animal running through the rafters. Can you tell how terrible this tire is? Compare it to the brand new one in the first picture. The gearing is too high for real hills. Always was, I toughed it out anyway. I'm not so young anymore, though. If I wanted to head for the hills I'd need to swap the sprocket... not an idle threat to an old bike. I'd probably have to change the whole drive train... sprockets, chain and derailleurs. For now, I'll just hope that the weather cooperates so I can get in a bike ride or two before winter shows up! I know this post is long, but I had to share. Maggie was a happy dog today. I finally felt energetic enough (since returning from Ohio) to go for a slightly longer walk today. I actually talked Om into going with me, so the three of us walked the 1.5 mile loop at Riverside Park on the Pere Marquette River. The river isn't spectacular there, but it's very peaceful, and it's one of my favorite walks. The problem is that it's really swampy and heavy with poison ivy growth. And in wet times of the year the trail is actually not passable - well, unless you are willing to get really, really wet! That means that the best times to walk it are in the fall and winter. 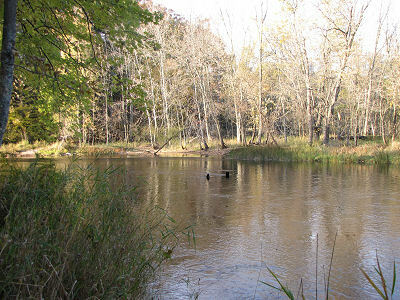 It's a quiet river, and popular for canoeing, but it has enough current that no swimming is allowed here at the park. Logs caught in the river provide places for turtles to sun themselves on warm days, but they are probably all snuggled in the mud for the winter by now. The heavy frost of yesterday, combined with some stiff wind this morning means that a lot of trees have dropped their leaves. But this red bush was still bright and full enough to be reflected in the water. By the time we were almost done the late afternoon light was helping to create some dramatic landscapes. This is the best of the bunch. To be honest, I spent a lot of the time chatting with Om, telling him about the Ohio hike. It's not too often that he will come with me, so I wasn't looking at the scenery, for details, or wildlife as much as most times. But that's ok... it was nice to spend some time together. Two Trumpets, Different Tunes and an Itchy Cow?